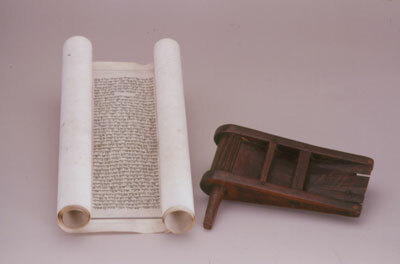 Megillah means “scroll,” from the Hebrew root “to roll.” Tradition designates five books of the Bible as megillot (pl. ), but the one most commonly referred to is the book of Esther. Read aloud in the synagogue on the holiday of Purim, it tells the story of the deliverance of the Jews from a massacre planned by the Persian king’s chancellor Haman in the 5th century B.C.E. This gragger was brought to America by Ezekiel Joseph Ellison, who landed in Baltimore, lived briefly in Savannah, and arrived in Charleston in 1883. Graggers, or noisemakers, are used in the traditional Purim service. Each time the villain Haman is mentioned, children in the congregation twirl graggers to drown out his evil name.